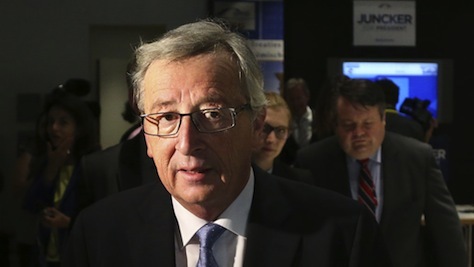 On Wednesday, the incoming president of the European Commission, Jean-Claude Juncker (pictured above), released full details on the proposed commissioners within his Commission, which will serve as the chief executive and administrative body of the European Union between 2014 and 2019. The most important feature of the proposed Juncker Commission is that he’s introduced the greatest amount of hierarchy in an institution that used to be flat. It’s not a secret that some portfolios have always been more desirable than others, especially as the Commission has expanded to include all 28 member-states. But Juncker has introduced a first vice president and five vice presidents, who will also serve alongside Italy’s foreign minister Federica Mogherini, who was appointed two weeks ago to serve as Commission vice president and high representative for foreign affairs and security policy. The delegation of so much power to five ‘super-commissioners’ with roving, supervisory briefs indicates that Juncker intends to be a much less hands-on Commission president that his predecessor, José Manuel Barroso. But it also reflects a Commission that, including Luxembourg’s Juncker, contains five former prime ministers (Finland, Slovenia, Latvia and Estonia). It also contains four incumbents (Germany, Sweden, Bulgaria and Austria) who have served throughout the full second term of the Barroso Commission. That makes the Juncker Commission possibly the most distinguished in EU history. Each commissioner must be approved by the European parliament and, while individual nominees have had troubles in the past, the parliament typically approves the vast majority of a Commission president’s appointments, all of whom were nominated by their respective national governments. With nine women, it’s not as unbalanced as feared even a week or two ago, and with 14 members of the center-right European People’s Party (EPP), eight members of the center-left Party of European Socialists (PES) and five members of the Alliance of Liberals and Democrats for Europe (ALDE), it generally reflects the results of the May 25 European parliamentary elections, though some social democrats and socialists are grumbling that the left doesn’t have enough representation. So what can we expect from this illustrious college of commissioners? Three days after the European elections, the reverberations are still shaking the entire continent, with leaders at the national and European level firing the first shots in what promises to be an epic battle over European integration — and that will determine who really calls the shots in the European Union. Last night, at an informal meeting of the European Council, the leaders of all 28 member-states of the European Union met to discuss how to approach the election of the next president of the European Commission, the powerful regulatory and executive arm of the European Union. The term of current president José Manuel Barroso, who has served in the role since 2004, will end within six months. It’s already starting to appear that, behind the scenes, the EPP, which won around 214 seats, and the PES, which won around 191 seats, are coming closer to forming a ‘grand coalition’ to back Juncker’s candidacy in a bid to assert the precedent that the Parliament should be the institution to determine the Commission presidency, not the Council. 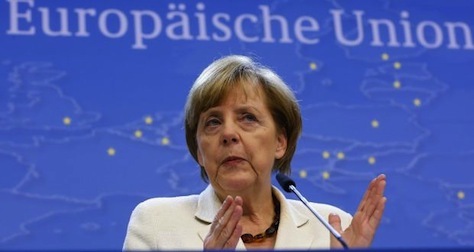 Both Juncker and the PES Spitzenkandidat, German social democrat Martin Schulz, have argued repeatedly that the Parliament should reject any Commission president that wasn’t among the original Spitzenkandidaten. But it’s not so simple. The Commission president must win not only a parliamentary majority. He or she must also win a qualified majority among the heads of government and state that comprise the Council, and enthusiasm among those leaders seems to be flagging for Juncker. RELATED: Here come the Spitzenkandidaten! But does anybody care? She also thanked Juncker for the “good campaign” he ran for the European People’s Party, but seemed slightly irritated by the avalanche of questions as to whether she backs Juncker to become the next EU commission president. “I don’t decide who gets the post. Juncker is our candidate, the EPP candidate, and we will put his name forward in the discussions. It’s always been said that it’s up to the strongest group to put forward the candidate, but just being the strongest group is not enough, a majority is required,” she said. Among national leaders, even among EPP stalwarts, Juncker’s candidacy is being met with skepticism. Hungarian prime minister Viktor Orbán and Swedish prime minister Fredrik Reinfeldt oppose Juncker outright. So does British prime minister David Cameron, whose position remains influential, even though the Conservative Party left the EPP in 2009. Dutch prime minister Mark Rutte, who is also close to Merkel, though he’s a member of the liberal bloc in the European Parliament, has also expressed private reservations about Juncker, and the media has openly discussed the idea that the Council could recruit Christine Lagarde, the former French finance minister and the current managing director of the International Monetary Fund, as its candidate instead. Intriguingly, Cameron has suggested that he might favor Danish social democratic prime minister Helle Thorning-Schmidt as Commission president. 9. European Union parliamentary elections, May 22-25. If for no other reason, the upcoming elections for the European Parliament will be the most important since direct EP elections began in 1979 because under the new Lisbon Treaty, it will be the European Parliament that decides who will become the next chair of the European Commission, the chief executive organ of the European Union (though German chancellor Angela Merkel has argued that the treaty’s language indicates that the Commission appointment need only ‘take into account’ the EP elections). In any event, it still means that early in 2014, each of the major cross-national party groupings within the European Parliament will designate their nominees to succeed José Manuel Barroso, the former center-right Portuguese prime minister who will step down in November 2014 after a decade heading the Commission. The eight European Parliament will have 751 members, over 56% of whom will come from just six member-states: Germany (96), France (74), the United Kingdom (73), Italy (73), Spain (54) and Poland (51). Four states, Estonia, Malta, Luxembourg and Cyprus, will elect the minimum number of representatives (six). Between 1979 and 1999, the Party of European Socialists (PES) and its predecessor was the largest group in the European Parliament. Its members include the major center-left socialist/social democratic parties of Austria, the Czech Republic, Denmark, France, Germany, Portugal, Spain and Sweden, and the labour parties of Ireland, Malta, The Netherlands and the United Kingdom. Since 1999, however, the European People’s Party (EPP), a group of center-right and Christian democratic parties, have held the largest number of seats. In the most recent 2009 elections, the EPP won 265 seats to just 183 for the PES. The EPP’s members include the major Christian democratic parties in Benelux, the Austrian People’s Party, the French UMP, Germany’s Christian Democratic Union Greece’s New Democracy, Hungary’s Fidesz, Ireland’s centrist Fine Gael, Italy’s Forza Italia, Portugal’s Social Democratic Party, Poland’s Civic Platform, Spain’s People’s Party and Sweden’s Moderate Party. The third-largest group, the Alliance of Liberals and Democrats for Europe Party (ALDE), contains includes most of Europe’s liberal parties, notably Belgium’s Open VLD, the Danish Venestre, Luxembourg’s newly elected Liberals, the Dutch VVD, the British Liberal Democrats, and Ireland’s Fianna Fáil. the European Alliance for Freedom, formed in 2010 as a staunchly euroskeptic, far-right group (whose members include the French National Front, the Dutch Party of Freedom, the Flemish Vlaams Belang and Austria’s Freedom Party). Although the EPP won’t determine its candidate for Commission president until a convention on March 6-7 and ALDE won’t determine its candidate until February 1, the PES has already nominated Martin Schulz, a member of Germany’s Social Democratic Party and president of the European Parliament since 2012. Polish prime minister Donald Tusk, Luxembourg’s Viviane Reding, the Commission’s vice president and current commissioner for justice, former Luxembourgish prime minister and Eurogroup chair Jean-Claude Juncker, former Latvian prime minister Valdis Dombrovskis, Lithuanian president Dalia Grybauskaitė, Swedish prime minister Frederik Reinfeldt and IMF managing director Christine Lagarde of France have all been touted as possible EPP candidates. ALDE will choose between former Belgian prime minister Guy Verhofstadt and Finland’s Olli Rehn, currently commissioner for economic and monetary affairs. Herman Van Rompuy, former Belgian prime minister and the first president of the European Council, the council of European heads of state/government, will also step down at the end of 2014 after two 2.5-year terms in that position. The first EU high representative for foreign affairs and security policy, Catherine Ashton of the United Kingdom, is also likely to step down. Given the tumult of the eurozone sovereign debt crisis, almost everyone expects that European voters may use the elections as an opportunity to register dissatisfaction with the direction of European governance. In particular, that could bode well for the stridently leftist MEP candidates — most notably in Greece, where SYRIZA (the Coalition of the Radical Left — Συνασπισμός Ριζοσπαστικής Αριστεράς) of Alexis Tsipras leads EP polls. 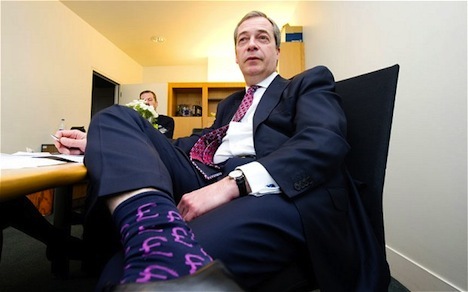 It could also bode well for euroskeptic candidates — most notably in the United Kingdom, where Nigel Farage (pictured above) and his anti-EU United Kingdom Independence Party (UKIP) is competing for first place with the Conservative Party and the Labour Party in EP polls, and in France, where Marine Le Pen’s nationalist Front National (FN, National Front) leads EP polls. Photo credit to Lucas Schifes.